With literacy comes word art. Or maybe word art came before literacy – the two are closely entwined. Decorative letters can be used for all sorts of purposes – spelling out names of businesses, identifying a residence for the mail delivery person, or even just sounding your “barbaric yawp” to the world. Before general literacy, written words seemed to be magic – an idea that many charlatans cashed in on, no doubt. Indeed, alphabets such as Ogham script were reserved for the priestly orders and taught in secrecy. There was an understanding that when you write something down, you create a permanence of idea. Large decorative letter blocks can reinforce that feeling of permanence and display your message in bold. One of the best uses of decorative letters has been to display business names. Whether the letters are three dimensional or painted onto a door, they make it easy for passersby to identify the establishment or perhaps to even locate a type of business that suits their needs. Perhaps one of the most famous uses of letters is the word “Hollywood” as it stands, picked out in lights, over that famous neighborhood. While that is an extraordinary use of letter art, it’s no less visible when it’s displayed in form of a home spelling out “The Smiths” or some other name. A prominently displayed name easily identifies your location for mail delivery or for emergency services, as well as for guests. Perhaps one of the most recent uses of word art is to deliver a message to the world. Those messages can range from “Jesus Saves” to “Writer at work: Interrupt at your own risk.” Some messages are more direct, and leave one wondering about the intent of the person, while others proclaim a willingness to embrace the world with happiness. But in each and every case, words make the meaning clearer than pictures. You can use letters to transmit your message. They can be large or small; rustic and distressed, or modern and shiny. Whatever it is that you wish to say, there is a set of letters “out there” that you can use to create your words. Below are several examples. Large letter blocks made in Mexico. The big letters are perfect for displaying the name of a business or to use decoratively. Curved letters in the set might need some help to stand up properly. Place them against a wall or team them with other landscaping details to solve this problem. All are handcrafted, which could mean some variation in size and shape. Nothing says endurance like a rusty, brown letter made of iron. Nest it among other arrangements or use a set of them to spell something out. Made in Mexico, and distributed by Trent Austin Design. These letters can easily put one in mind of ghost towns and tumbleweeds out in the desert, waiting for you to explore. 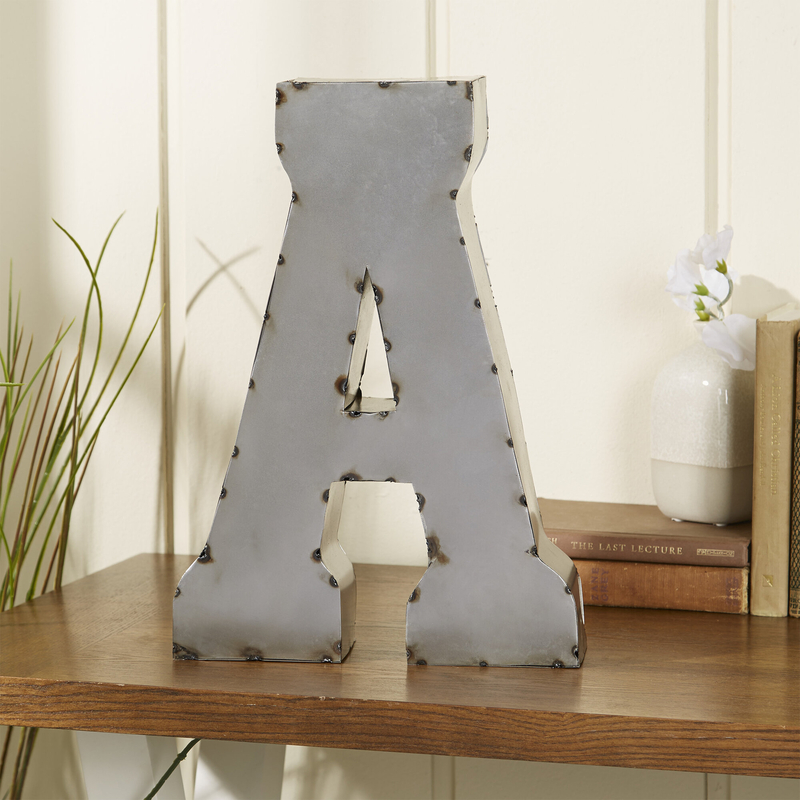 These small, distressed galvanized metal letters could be just the thing for a door plate or mailbox. Made in the US, and distributed by Gracie Oaks, they can be used as standing letters or hung for display, making them perfect for word art. Reminiscent of old tin roofs or country farm kitchens, they are perfect for a country or cottage décor. Standing orientation only, but what a stand! These highly polished metal letters can be used alone or to spell out a special message. Bright, contemporary and modern, they can create an ambiance of Now like no other. Add some bright tinsel stars and battery-operated tea lights for an up to the minute table arrangement. Tired of buying desktop calendars year after year? Then this distressed, vintage wood block perpetual calendar is just the thing for you. Change the blocks daily to display the month and day, all that is missing is the year. More than that, this is a calendar that will never require batteries or electricity. Accompany it with an old-fashioned analog, wind-up clock to complete your desk ensemble. Angulay Driftwood Beach standing letter blocks bring the feel of the ocean, castaways and shipwrecks with them. Made from distressed wood and decorated with rope, these letters are sure to be a hit at your next Pirate party. Brought to you from Highland Dunes. Spell out your intent with these distressed wood letters spelling one of the most important (and perhaps most misunderstood) word in the English language. The letter L has added typographic details, showing its intent. It’s a perfect gift for a wedding or for an anniversary celebration. The Sutherland Love Letters are brought to you by Andover Mills. If you need a classy way to stake your claim on an office or desk, here they are – mirrored glass letters brought to you by Boston Warehouse Trading Corp. It doesn’t get any shinier or brighter than this unless you are putting your name up in lights. Also good for spelling out messages on banquet tables. Announce your location with this aluminum acrylic letter blocks – set of two – that spell out the word “home” in modern script. Perfect for placing on a mantle or word wall, or even to use as part of a scavenger hunt game, the gilding shows the importance of the word. It’s suitable to be placed almost anywhere in your space where you feel the need to remind yourself of where you are. Make an area or a room special with these distressed, rustic wood block letters. Spell out a name, or just use one letter as an initial. These letters give a special look to a word art arrangement that is unmatched by any other. O’Rourke decorative router wood blocks might be just the thing for a teen’s room or for a centerpiece at your next dinner party.